Steam is used throughout industrial process control operations in various ways. The ability of steam to serve as a means to deliver heat and provide motive power to a facility or process keeps it in wide use throughout many industries. Heating with steam can by of a direct or indirect nature. Direct heating uses steam distributed into or onto a substance to directly affect its temperature. In order to ensure success in direct heating, mixing needs to occur so that the temperature of the substance is uniformly impacted. Indirect heating uses one of the many available forms of heat exchangers to transfer heat from steam to process fluid across a physical barrier that isolates the process fluid from the steam. Industries employ steam for many valuable uses. Food processing factories, refineries, and chemical plants utilize positive pressure steam. In most instances, steam is delivered to equipment, typically, at pressures above atmospheric and at a temperature exceeding 100°C. 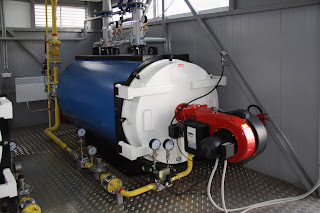 Process fluid heat exchangers, reboilers, air preheaters for combustion, and a range of other heat transfer equipment uses steam as the heat source. A shell and tube heat exchanger raises product temperature on its passage through the unit. Ideally, the heat exchanger expels condensate after removing the latent heat from the steam. Condensate can be collected and returned to the steam generation portion of the system, conserving much of the energy used to originally heat the water. Hot water was the main agent traditionally used for heating at temperatures below 100°C. Using steam to heat at temperatures below the 100°C benchmark is an increasingly popular technique. Vacuum saturated steam can be applied in the same way as positive pressure saturated steam, but the steam temperature is adjustable by altering the pressure. The ability to change the pressure (and the temperature) allows for more precise temperature control when compared to using hot water. Another advantage of using steam over hot water is that the steam heating system is fast and precise. The desired temperature can be reached quickly and uniformly. Another popular use for steam in industrial settings is as a propulsion or drive force. Steam turbines generate electricity in thermal power plants. A recent trend, developed to minimize wasted energy, is applying steam at increasingly higher temperatures and pressures. Superheated steam, used in steam turbines, acts as a counter to potential damage to the equipment resulting from condensate in the turbine section. Less chance of condensate in the turbine translates into a reduced risk of equipment damage or failure. Nuclear power plants, though, cannot utilize the advantages of superheated steam because of complications arising involving the steam and the turbine material. To combat this problem, high pressure saturated steam is utilized instead, with upstream separators installed to remove condensate from the steam flow. In addition to power generation, steam acts as the force behind turbine driven compressors and pumps, including gas compressors and cooling tower pumps. Depending on the process being controlled and the specific industry’s demands, the simplicity and various applications of steam make this reliable medium a first choice for industrial operations. Share your steam system and use challenges with combustion and steam experts, combining your own knowledge and experience with their specialized expertise to develop effective solutions.